If you have ever been to Greece it would be impossible to have missed out on this delicious Greek shrimp saganaki appetizer, served in every Psarotaverna (fish tavern)! This is a very easy Shrimp saganaki recipe for you to recreate this simple and beloved traditional Greek appetizer from scratch in less than 20 minutes and is inspired from a recipe that I first saw at the island of Santorini back in the 70’s..! Saganaki‘ refers to various Greek appetizers, which are prepared in a small, two handled heavy bottomed frying pan, itself called a saganaki or sagani. The most common traditional Greek recipes cooked in a saganaki pan include cheese saganaki and mussels saganaki. When preparing a Greek shrimp saganaki recipe, the shrimps are first sautéed in olive oil, deglazed with traditional Greek ouzo drink, then added in a spicy tomato sauce and finished off with fresh herbs and salty feta cheese.. Simply irresistible! Prepare this traditional Greek shrimp saganaki recipe with fresh medium or large sized prawns if you are lucky enough to find them. For our shrimp saganaki recipe you will need to prepare the shrimps in advance. Peel the body of the shrimps and clean, leaving the heads and tails on for extra flavour. It is very important to clean the inside of the shrimps by gently slicing with a knife crosswise the back surface of the shrimp and removing the dark vein with a toothpick or a knife, as this is annoyingly crunchy and may contain sand inside that will ruin your shrimp saganaki. It is best that you sauté the shrimps over gentle heat, as their flesh is very sensitive. When preparing this Greek saganaki recipe be careful not to overcook your shrimps to remain juicy and tender. For the traditional Greek shrimp saganaki recipe, the shrimps are deglazed in ouzo drink which gives a unique taste, so try to find some for this extra flavour, or else substitute with dry white wine. For the sauce of the shrimp saganaki use some juicy, ripe fresh tomatoes. If your tomatoes are underripe it’s best to use some canned chopped tomatoes and balance the acidity with a pinch of sugar. So go ahead prepare this amazing Greek shrimp saganaki recipe and serve as a delicious maze/starter with lots of bread aside to mop up every single drop of its delicious sauce! Enjoy! To prepare this Greek shrimp saganaki recipe start by peeling and cleaning the shrimps. Continue preparing the sauce. To prepare the sauce for this shrimp saganaki recipe, dice the fresh tomatoes in small cubes and let them strain in a colander, so that no excess water is added to the sauce. Beginning with the sauce for the shrimp saganaki, heat the olive oil over medium-high heat, add the chopped onion and sauté for 1 minute. Stir in the chopped garlic, chilli peppers and season with salt and and pepper. Sauté all the ingredients together for 1 more minute. Add the chopped tomatoes, cover with the lid, bring to the boil and let simmer for approx. 5 minutes, until the sauce thickens a little bit. In the meantime sauté the shrimps for this shrimp saganaki recipe. Season the shrimps with salt and pepper on both sides. Heat a large saucepan over medium heat and add 3-4 tbsps olive oil. Add the shrimps, sauté for 1 minute on each side and deglaze with the ouzo. Pour the sauce in the saucepan along with the shrimps and stir. Top the shrimp saganaki with the crumbled or cubed feta cheese, place the lid on and cook for 3-4 more minutes, until the feta slightly melts. Garnish the shrimp saganaki with chopped parsley or dill and serve while still hot. 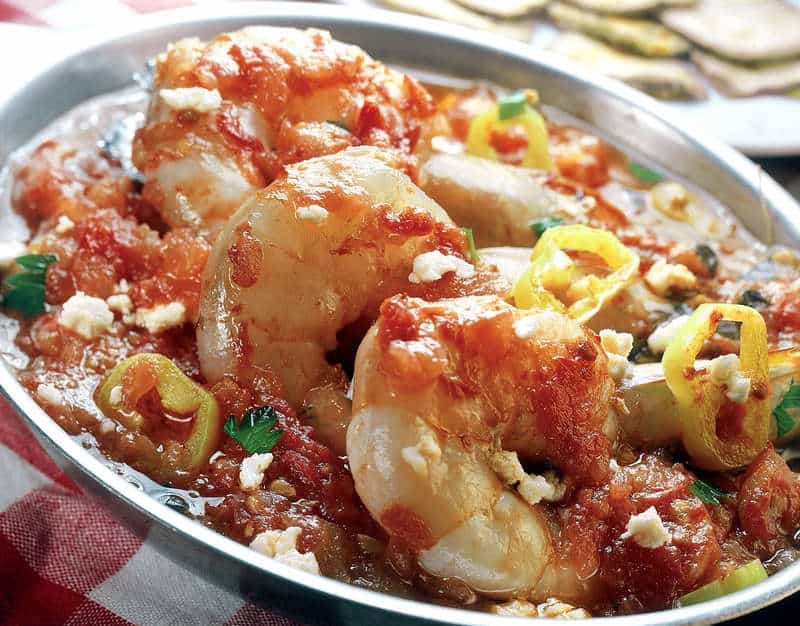 Enjoy this traditional Greek shrimp saganaki recipe with a cold glass of ouzo! Never tasted such shrimps, you’re champion! If you cook the prawns as long as the recipe suggests they will become too tough and dry; avoid it the recipe needs adjusting…..
Hey! Is there any non-alcoholic substitute for Ouzo? Thanks! You can leave it out completely. You mention ” some hot chili pepper” in your list of ingredients. In the USA, this refers to a dry spice. In your photo, I notice some yellow banana or hot Hungarian peppers you otherwise don’t list in the ingredients. Is that what you are referring to when mentioning chili pepper? Well in the rest of the world, it means any fresh chilli you want to use. IE Jalapeño Medium spiced, nothing to strong as it will take away from the dish.